The more files you store on a computer, the more difficult it will become to keep them all in order and with the correct names, and to change several file names at the same time the tools offered by Windows aren't really feasible, to say the least. But with Advanced Renamer it can become a very easy task. Change the names of your files very quickly. 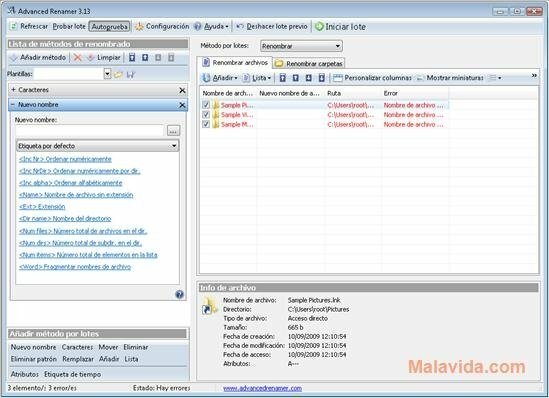 The methodology used by Advanced Renamer to rename both files as well as folders allows you to make this task a really simple procedure that will take place almost instantly. 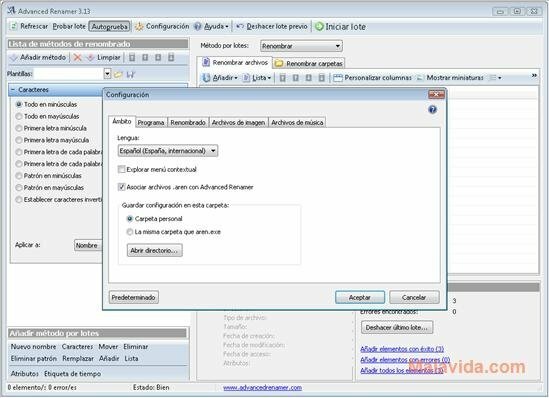 You only need to select the files that you want to change the name of and establish the rules that they have to follow during the change, and Advanced Renamer will carry out the operation. Furthermore, Advanced Renamer includes certain additional tools to work with video and audio files, in such a way that the name of the video files aren't too long and that the music files can be renamed using the information stored in their tags. Therefore, if you often need to change the name of your files, the best solution that you can find is Advanced Renamer.